Blue Jazz is a dwarf selection of piñon pine (Pinus monophylla) that features pointed blue-toned needles that curve upwards towards the sky and an overall teardrop shape that adds a unique texture and color to the landscape. It was selected by renowned dwarf conifer expert Jerry Morris at a location west of Sacramento Pass near Baker, NV at about 8,000 feet in elevation. This selection is a single needle form of piñon pine, a group of trees known to survive for hundreds of years. They’ve evolved to exhibit single-needled leaves in order to conserve water, while most other pines exhibit multiple needles per bundle (or fascicle). This xeric treasure is a great choice for all water conscious gardeners who recognize the growing concerns of water resources in our region and seek a plant that is unusual, compact in size and evergreen. Plant this little beauty in hot, dry locations where reflective heat may have been a problem or in rock gardens where an evergreen element is desired. Blue Jazz is a tough resilient plant, but is best in locations with light or no foot traffic, as broken branches can affect the overall shape and habit. Simply put, this plant is a must have for all xeric landscapes. Over time Blue Jazz grows slowly and steadily and will be a distinctive stand out in the landscape, much like Louis Armstrong in a jazz ensemble. 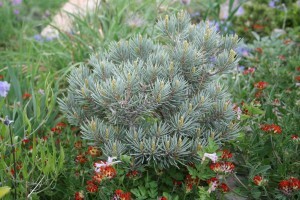 Where can I buy Blue Jazz piñon pine? I live in Durango, CO.
Kirk Fieseler at Laporte Avenue Nursery, Fort Collins, sells them wholesale. I’ve got a query into him about retail sales or who he ships to down your way. Will let you know when I hear back! Ditto. Also live in Durango Colorado and wanting to get some blue jazz pinion pines.